Israel has lived the past sixty years more intensively than any other country. Its highs – the resurrection of a two-thousand year old state in 1948, history's most lopsided military victory in 1967, and the astonishing Entebbe hostage rescue in 1976 – have been triumphs of will and spirit that inspire the civilized world. Its lows have been self-imposed humiliations: unilateral retreat from Lebanon and evacuation of Joseph's Tomb, both in 2000; retreat from Gaza in 2005; defeat by Hizbullah in 2006; and the corpses-for-prisoners exchange with Hizbullah last week. An outsider can only wonder at the contrast. How can the authors of exhilarating victories repeatedly bring such disgrace upon themselves, seemingly oblivious to the import of their actions? One clue has to do with the dates. The highs took place during the state's first three decades, the lows occurred since 2000. Something profound has changed. The strategically brilliant but economically deficient early state has been replaced by the reverse. Yesteryear's spy masterminds, military geniuses, and political heavyweights have seemingly gone into high tech, leaving the state in the hands of corrupt, short-sighted mental midgets. How else can one account for the cabinet meeting on June 29, when 22 out of 25 ministers voted in favor of releasing five live Arab terrorists, including Samir al-Kuntar, 45, a psychopath and the most notorious prisoner in Israel's jails, plus 200 corpses? In return, Israel got the bodies of two Israel soldiers murdered by Hizbullah. Even The Washington Post wondered at this decision. Israeli prime minister Ehud Olmert endorsed the deal on the grounds that it "will bring an end to this painful episode," a reference to retrieving the bodies of war dead and appeasing the hostages' families demand for closure. In themselves, both are honorable goals, but at what price? This distortion of priorities shows how a once-formidably strategic country has degenerated into a supremely sentimental country, a rudderless polity where self-absorbed egoism trumps raison d'être. 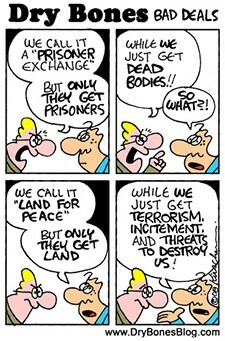 Israelis, fed up with deterrence and appeasement alike, have lost their way. Appalling as the cabinet decision was, worse yet is that neither the Likud opposition party nor other leading public Israeli institutions responded with rage, but generally (with some notable exceptions) sat quietly aside. Their absence reflects a Tami Steinmetz Center poll showing that the Israeli population approves the swap by a nearly 2-1 ratio. In short, the problem extends far beyond the official class to implicate the population at large. 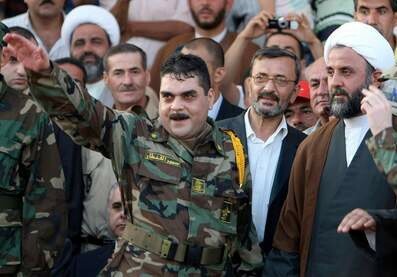 Samir Kuntar on arrival in Lebanon, complete with Hizbullah uniform and "Heil Hitler" salute (AFP). On the other side, the disgraceful celebration of baby-murderer Kuntar as a national hero in Lebanon, where the government shut down to celebrate his arrival, and by the Palestinian Authority, which called him a "heroic fighter," reveals the depths of Lebanese enmity to Israel and its immorality, disturbing to anyone concerned with the Arab soul. The deal has many adverse consequences. It encourages Arab terrorists to seize more Israeli soldiers, then kill them. It boosts Hizbullah's stature in Lebanon and legitimates Hizbullah internationally. It emboldens Hamas and makes a deal for its Israeli hostage more problematic. Finally, while this incident appears small compared to the Iranian nuclear issue, the two are related. International headlines along the lines of "Israel Mourns, Hezbollah Exults" confirm the widely held but erroneous Middle Eastern view of Israel as a "spider's web" that can be destroyed. The recent exchange may give the already apocalyptic Iranian leadership further reason to brandish its weapons. Worse, as Steven Plaut notes, by equating "mass murderers of Jewish children to combat soldiers," the exchange effectively justifies the "mass extermination of Jews in the name of Jewish racial inferiority." For those concerned with the welfare and security of Israel, I propose two consolations. First, Israel remains a powerful country that can afford mistakes; one estimate even predicts it would survive an exchange of nuclear weapons with Iran, while Iran would not. Second, the Kuntar affair could have a surprise happy ending. A senior Israeli official told David Bedein that, now out of jail, Israel's obligation to protect Kuntar is terminated; on arrival in Lebanon, he became "a target for killing. Israel will get him, and he will be killed … accounts will be settled." Another senior official added "we cannot let this man think that he can go unpunished for his murder of a 4-year-old girl." Who will laugh last, Hizbullah or Israel? July 22, 2008 update: For more on this story as it develops, see "Samir Kuntar, Back in Lebanon." July 28, 2008 update: Yoram Schweitzer challenged the appropriateness of my offering views on the Israeli government's exchange with Hizbullah in "Not That Bad a Deal," The Jerusalem Post, July 24. I reply to him today, again in the Post, at "May an American Comment on Israel?" Aug. 3, 2008 update: Schweitzer has again critiqued me, at "Obfuscation and Oversimplification," to which I responded at "A Final Reply to Yoram Schweitzer." Related Topics: Arab-Israel conflict & diplomacy, Counter-terrorism, Israel & Zionism | Daniel Pipes receive the latest by email: subscribe to the free mef mailing list This text may be reposted or forwarded so long as it is presented as an integral whole with complete and accurate information provided about its author, date, place of publication, and original URL.